Vegetarian Delilght, kay wot besega (beef), alitcha wot (beef), and salad. 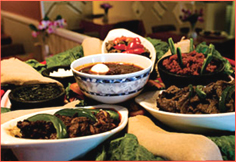 Tender pieces of beef sauteed in seasoned butter, fresh onion, garlic, and ginger sauce served with pieces of injera and soaked with sauce. Green beans are roasted to enjoy the aroma, and then the roasted beans are ground and boiled in Jebena (unique coffee kettle), served in samll coffee cups). 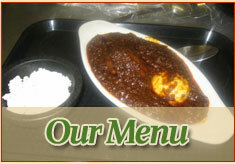 We offer catering services for all types of special events.